The news comes from Aligarh where a baby girl has captured the attention of all and sundry for she has ‘trunk’ by birth and now visitors come in a great mass for worshipping her, believing that it’s a miracle from God Ganesha. 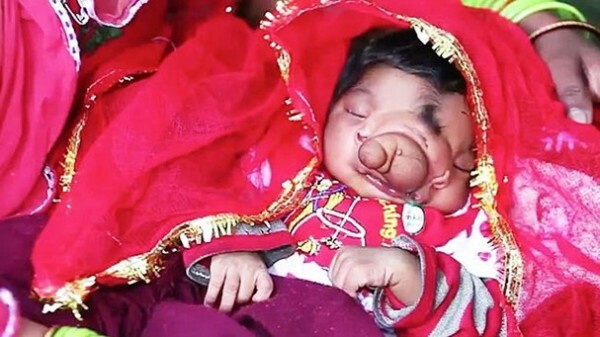 Her birth took place on Thursday and she had a bulge in the middle of both eyes that public assumed as Ganesha’s trunk. As soon as people came to know about this baby girl with born ‘trunk’, they head to the family in a large group for a glimpse of the child and making offerings. Not only this, people also regarded the girl as ‘Lord Ganpatni’ which means ‘Ganesha’s wife’. Aside from them, the girl’s father is also of the opinion that his fourth child would be lucky for him. According to doctors, protrusion is an outcome of gene mutation which might happen because of augmented pollution levels together with malnutrition.